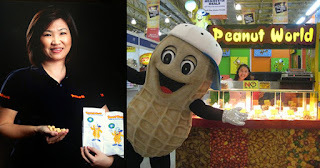 Filipina Entrepreneur Has Almost 20 Mall Kioks Selling Peanuts -- And in a Nutshell, She's Winning! Josephine C. See, is the founder of Peanut World, a popular mall kiosk that sells all kinds of delicious peanuts, cashews, popbeans, and cornicks. At first glance, it may appear to be a very amateurish idea, but Josephine has almost 20 locations throughout the Philippines and generates millions every year in revenue! The concept of Peanut World began in 1996 when Josephine and her husband noticed a small store selling nuts. The number of customers buying peanuts drew their attention, and being peanut lovers themselves, they started conceptualizing and researching about the business. But the idea didn't really take off until 2006 when Josephine decided to partner with a local franchise association to quickly expand the business by using mall kioks (also known as food carts). Although selling peanuts sounds simple, the key to her success was being better than her competitors and offering something they didn't offer - a variety of delicious flavors. So she decided to offer "Adobe Skin" peanuts which are cooked with a lot of garlic and lightly salted. She also sells "Adobo Skinless" peanuts that are cooked the same way, but without the skin. She also sells cashew nuts that are leaned and roasted to perfection to bring out it’s rich and sweet flavor, cracker nuts that are coated with a delicious garlic batter, and greaseless peanuts that are oven baked with garlic and just a dash of salt. In the Philippines, like most other countries, business is mostly male-dominated. But Josephine has proven that even the simplest idea can be very profitable. Sometimes, women entrepreneurs are looking for a great business idea, and the concept is right there in front of their face.